Imagination Workers can collaborate visually to better understand problems, develop concepts, align teams and innovate anywhere - beyond physical limitations of meeting rooms and in-person workshops. 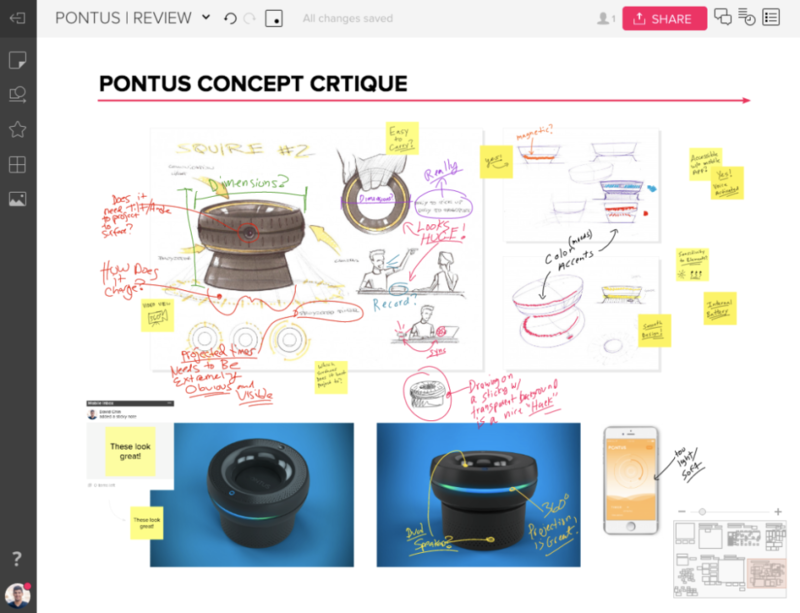 Digital workspaces for visual collaboration, inspiration and innovation - anytime, anywhere, on any device. Pros: I love that Mural lets me choose the size of my virtual sticky note, adjust the color, and add text to it, because this helps me organize my thoughts and categorize things as I see fit. I feel I have creative control of how I want to organize my thoughts. I also love the options to use shapes and lines to organize thoughts within a larger framework, which takes the sticky note concept a step further. I also really like the voting mechanism - people can vote on ideas (on sticky notes) and are given a certain amount of votes. Other people can't see these votes until voting has ended, which is a great way to reduce bias and have everyone looking at and choosing from the same ideas. As an organization with lots of remote workers, we use Mural often to collaborate in brainstorming on an online platform. It's our go-to. Cons: The best way to share with specific people seems to be to send them a link, but in terms of sharing for a wide audience, It's not always straightforward to export the mural itself into a report or another document. I usually have to take a screenshot, which can't always capture everything going on within the mural in question because you have to zoom out so much to capture everything. Overall: At work, I'm known as the sticky note queen. I always have so many thoughts swirling through my head and need a place to keep them, so I've historically used sticky notes. But sticky notes can only get me so far - they literally don't always stick around, I only have room for so many, my work space feels incredibly cluttered because of them , and there's no easy way to show a relationship between/ amongst the thoughts they represent. I love mural because it's a collective dumping of thoughts onto an online platform. I can create processes, show relationships between thoughts, collect others' thoughts, and organize it all together. It's the sticky note brainstorming tool of the future. Pros: Mural is hands down the most versatile visual communication tool available today. What I love the most is that I can use the tool every day and that its easy enough for most people to get the hang of within a few minutes, allowing anyone to interact in high fidelity. Overall: This tool achieves many problems and is suitable for everyday use, personal use, small groups, and large working groups. Small Groups: can quickly move ideas into visual representations that make it very easy to share with other people. MURAL's often become the foundation for projects which people come back to time and time again. It is very satisfying to collaborate with colleagues in this way as much of the applications we use day to day are only design for single users. Workshops: MURAL is powerful when put in the hands of a facillitator who can then guide a group of people through experiential learning and discussions which lead to emergent thinking and non-intuitive insights. Visual Documentation: Over the years I have become very proficient as a visual note taker in mural and can listen to speaker or meeting proceed and capture the meeting in a visually engaging way. 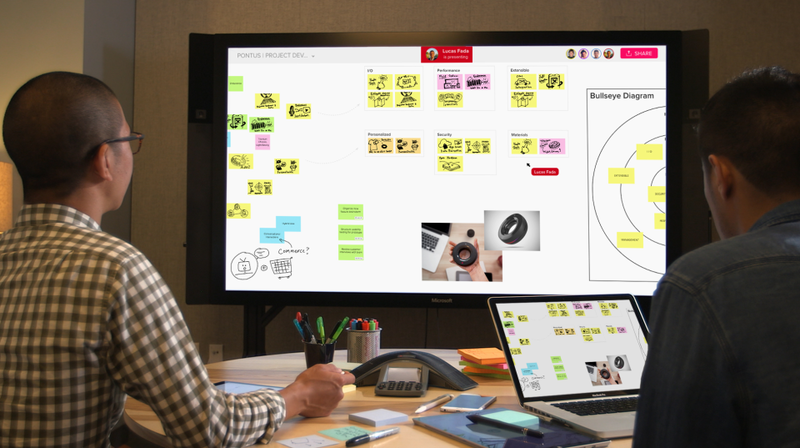 Pros: Gone are are the days when you have to be co-located to run a workshop or collaborate with remote product teams, you can now think and collaborate visually anywhere anytime. I love how it mimics the real world experience of brainstorming, project planning or synthesizing the data, a lot of data. It does it all in real time without the needs of the team to be co-located. 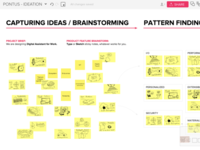 If you are new to design thinking, they already have the readily available template which can be used to run a workshop or just brainstorm the ideas. It works better on laptops/desktops but the best on touchscreen devices. A dream setup would be giant touch screens in all the locations. Cons: Downloading the date for offline use takes time, It sends download link on registered email id. Time taken for that email to hit your inbox is not consistent, sometimes you get it within seconds and sometimes it takes minutes. Overall: So far the experience has been smooth and rewarding, You don't need to travel to brainstorm ideas quickly with your remote teams or planning a project with teams in multiple locations. Pros: I really appreciate how easy it is to dive in and get started with little complexity or knowledge. Drop some stickies on an empty whiteboard and you're off ... or play with templates, voting, and other advanced features to drive amazing new collaborations that are only possible in the digital world. Cons: In the past, I have disliked the lack of feature parity between web and mobile versions. That has recently improved. Overall: I've been able to grow with mural and explore new worlds of collaboration ... both enhancing face to face workshops and enabling remote collaborators to have equal voices. Support from the mural team to help us explore new ways to effectively collaborate (not just use their software) have been compelling. Pros: Mural is the tool I've always been looking for to visualise concepts and create conceptual maps. But it is not only this, it can be a presentation tool, you can make infographics with it, you can easily and rapidly create artwork that does not need the use of Photoshop or Illustrator. It's the tool everybody should use to present ideas to the customers. What I like most of Mural is the ease of use, the millions of icons you have and can personalise with colour and the fact that you can drag and drop text, links, videos and gifs. Cons: Few options could be improved to make it even better. For example you cannot decide the size of text therefore when you enlarge text boxes you loose track of the size. There is no option to create simple tables yet, deciding the number of columns and rows. There is no media library so you have to upload every time images instead of choosing from a library or copy and paste them from another mural. Alignment sometimes is not very accurate. Overall: In my company we work a lot with design thinking and we create murals for our clients to make them create strategies. This tool has become necessary for our daily work and we could not be happier to be able to create such a good work in so less time, because Mural is so easy to use and intuitive and possibilities are endless. Pros: It's a virtual design studio on your computing device (yeah I said that). Cons: There have been occasions where I ran out of canvas on multi-day design events. The new, larger ideation space has largely fixed that. Overall: Mural is the most intuitive and creative ideation software I have come across. No idea can hide if you get your organization on-board. There are low barriers to learning the tool so it is an easy sell. Pros: Canvas style whiteboard in the cloud with the right tools on-board to collaborate in a visual manner. 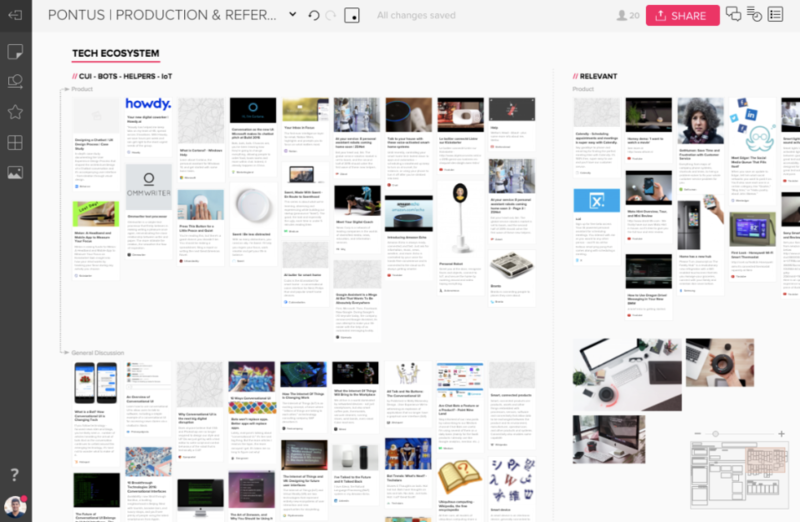 The new platform for thinking and making, together. Pros: I love creating, consuming and using templates for remote workshops. It's like doing software design, but with super direct and immediate, authentic feedback. A must have for distributed teams! Pros: It's amazing for facilitating remote meetings and enabling equal participation between people all over the world. Cons: User management is the stickiest part. You can deactivate people who become inactive so you aren't being billed for them, but Slack has a nice feature that automatically does that and automatically turns them back on. If you deactivate someone, an admin must manually reactivate them upon request. It's a minor admin slowdown, separate from the actual functionality of the collaboration tools. Overall: I have hosted entire multi day design sessions and Sprints with complex activities and it's been amazing. Pros: This tool allows teams to take the complicated, organically generated, unsorted data that can come out of brainstorming or workshops and arrange it into something meaningful. It creates a standard language for teams to express this info. It's quick to learn and easy to use, and allows for the right type of expression for any info set. Cons: Administrating a team could be done better. It's too easy to invite more team members than your plan pays for. This is because the button to share a mural to an email address (which adds a team member) is easier to get to than the link to share anonymously. Fortunately there is a 30 day grace period for these mistakes. Overall: This is a foundational tool for us for capturing any postit note exercise or workshop session. Pros: Mural is indeed collaborative ! The fact that you can see what the other person around the world is doing, without sharing screen, is amazing ! Mural is that digital whiteboard with free stickies where you could do anything ! And it comes with so many templates !! Cons: We cannot talk via mural . I'd need another software or tool to do that! Imagine Mural + slack in one ! Overall: It's a brilliant tool. There hasn't been an experience with mural that has not gone well. Must have ! Mural is for great collab! 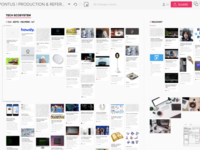 Pros: We have tried and tested a few different versions of the learning portfolio. Using Mural as a learning portfolio is one of the most effective ways I have found that students can capture their learning and experiences. It is a non-linear way of demonstrating how our learning is multifaceted and interconnected. It allows students to be ultra creative in how they represent and capture their skill acquisition. It is rare that students in science are asked to be creative. Having this creative outlet allows students to express themselves in a different way! Pros: The mural.ly team is constantly garnering feedback in order to improve the product. While mural is a great concept to digitize the whiteboard, the execution is solid with room to improve. Great selection of icons and stickers. Cons: For my peers, I have observed it requires a higher learning curve in order to understand the controls and wayfinding around the board. 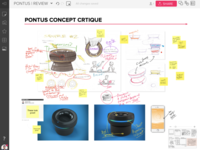 Pros: Mural has allowed me (a member of a virtual team) to advance our organization's use of Human-Centered Design techniques without always having to bring the group into an in-person meetings. Because of the savings in cost / time due to virtual work, it more than pays for itself, AND it helps to keep the teams connected and brainstorming together. Cons: It can take a little while for teams to get used to it and come up to speed on how to use it most effectively. Pros: I started using Mural when working with a remote team that already made heavy use of it. I found it incredibly simple to start contributing, but also made note of the depth of optional functionality available. I've started using Mural for other projects even with co-located teams, as it means that all of the documentation from a brainstorming meeting is automatically digitised. Cons: There is at times confusion around the "scale" of any virtual space - at times there have been hilarious disconnects when we are branching out and creating content in different areas of the canvas only to see one person was super zoomed in while another was zoomed out. Pros: I work with team members around the country. We use Mural to collaborate and brainstorm ideas using "digital note cards". Everyone can participate easily as if we were all standing around the same whiteboard. Pretty cool. Cons: The price was more than I was expecting. About half our company is remote, so getting licenses for everyone was an out-of-budget expense. It ends up costing about as much as our annual expense to lease our Macbooks. Seems pricey. 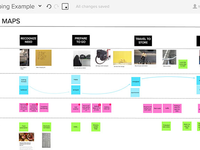 Great tool for creating a whiteboard of sticky notes and sharing it. Pros: Super super easy to use with nice on boarding that guides you through the setup process. Easy to share info with your team. Cons: Sometimes it feels a little over engineered and fiddly to do things, most of the functionality is also available in apples "Preview" app for free so its hard to make the leap to a paid account. 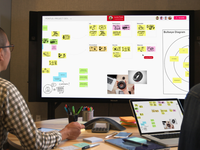 Pros: I like the concept of a digital whiteboard, and the collaboration tools are on the spot. Cons: No infinite canvas, wayfinding for rooms is awful, not enough customization for layouts and colors of things. Too restrictive sometimes on what you can create(like creating "areas" in Real Time Board). Overall: It works, it's better than not having a digital whiteboard product if you have remote teams working together, but it's not the best digital whiteboard product out there. Pros: Mural really excels in two different areas - functionality and very smart features. They continue to improve their product with new features in a timely basis, while focusing on customer feedback. Cons: Mural should continue to roll out new features and improve integration with outside apps in order to live in to the price tag. Overall: Mural satisfies nearly all of my needs, and is overall a beautiful product. Mural empowers remote teams to run world class virtual workshops. Pros: Mural is surprisingly easy to use compared to any other digital whiteboard I have used. 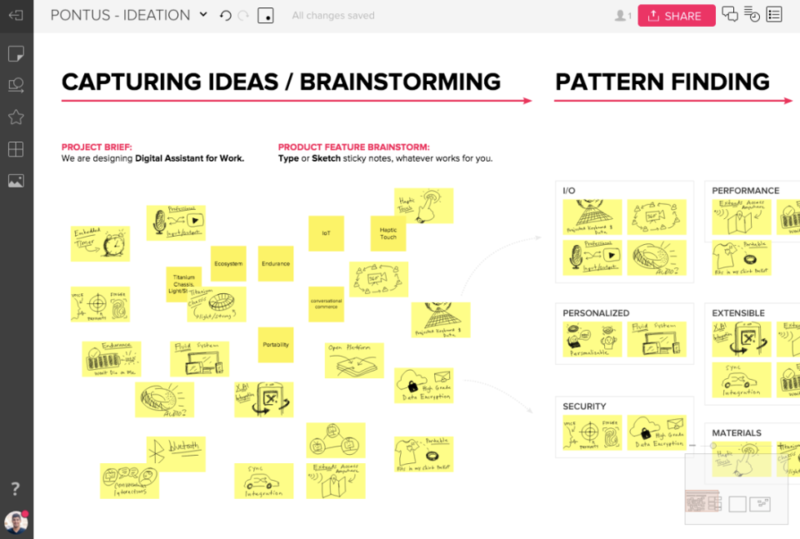 Its sticky-note forward design makes creating and manipulating ideas a breeze. It enabled our team to do an impactful design sprint remotely. I was amazed. Cons: Overall my experience has been great with Mural. The pricing feels high for its utility, as its not something I use everyday.